Millions of Americans enrolled in health coverage under the Affordable Care Act last year, but 30 million adults remain uninsured, reports the Kaiser Family Foundation (KFF). Of these 30 million individuals, nearly half qualify for some form of coverage assistance, be it either Medicaid (18 percent) or marketplace insurance tax credits (30 percent). So why didn’t they choose to enroll? 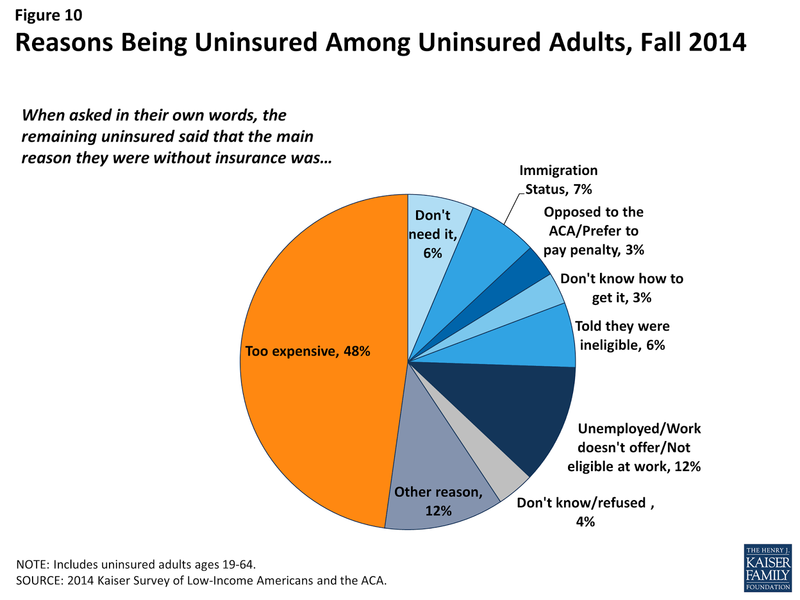 KFF conducted a survey of 10,000 adults to learn why these uninsured adults had not sought coverage. The main reason? Nearly half (48 percent) reported coverage was too expensive, even among those who qualified for free or low-cost coverage through Medicaid and marketplace tax credits. Other leading reasons included insurance not offered at work (12 percent), immigration status (7 percent), and being told they were ineligible (6 percent).